Osteoarthritis – What Can You Do About It? I am one in five adults battling arthritis. Osteoarthritis, also known as OA, is one of the most common forms of arthritis that affect the entire joint involving the cartilage, joint lining, ligaments and underlying bone. As these tissues wear out, it leads to pain and joint stiffness. 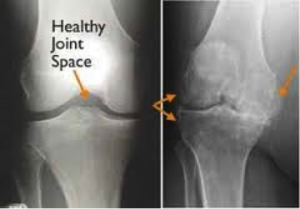 The joints most commonly affected are the knees, hips, and those in the hands and spine. There is no specific cause of OA, but it is believed to be the result of both mechanical and cellular changes in the affected joint. OA is gradual and usually begins a short time before age 50. I see clients with OA nearly every day. There are certain risk factors such as trauma, obesity and general muscle weakness that can have a profound effect on the disease, but can be kept at bay with physical activity. Working out with good form regularly in a supervised setting (in a group or privately) can help improve joint flexibility and reduce stiffness and pain. As a Certified Arthritis Instructor and Corrective Exercise Specialist who understands the needs of her clients, having the right tools and with specific guidance I am able to help my clients with this condition. Benefits – Muscles help support your joints; improving muscle strength is key for people with arthritis. Aerobic/endurance exercise can reduce fatigue, joint pain and stiffness. An added benefit is weight loss, which reduces the stress on joints. Gentle stretches and exercises that take joints through their full range of motion can help you move about throughout the day. Challenges – Overexertion. Pain that lasts for more than two hours (this is the one of the Golden Rules of the Arthritis Foundation) after exercise is an indication that the exercise should be modified or eliminated from the routine. Clients with arthritis need a program tailored not only to their fitness level and goals but also to their joint-pain tolerance and ability to improve their range of motion. People with osteoarthritis shouldn’t flex (bend) the spine; correct form is crucial for movements such as bending at the hips. Certain joint surgeries or injuries may further restrict movement. Modifications – Start with light weights, resistance bands and medicine balls. It is best to exercise when you have the least joint pain, usually after you have been awake for an hour or more. Avoid training on an unstable surface, unless you can do so safely. For example, can you stand on one foot for 10 seconds? Focus on low-impact exercise, such as walking or swimming. You might take a class specifically designed as low impact. Incorporate moves that mimic everyday activities (functional) such as reaching for a door or putting on socks and shoes. Use music to soothe and make it fun; a way to distract from “normal” pain. Consider any surgery or injuries you have/had. Learn proper form so you don’t re-injure yourself. Also remember to stretch your hands, wrists and fingers, which are often affected by arthritis. For more information on Lori Michiel Fitness training with Lori or her team of experts, you can reach us at www.lorimichielfitness.com, email us or call us at 818-620-1442 today. We see fitness differently!